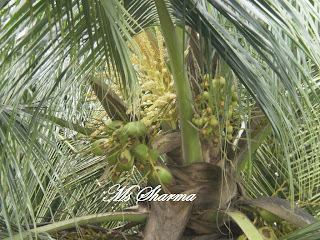 Coconut belongs to Palm family. Coconut is the fruit of Coconut palms and is found mostly in tropical areas. It is a staple food of the tropics. In South India it is used almost daily in one form or the other. It has got religious and cultural significance too. That is why every house has at least one tree, especially in the coastal areas. 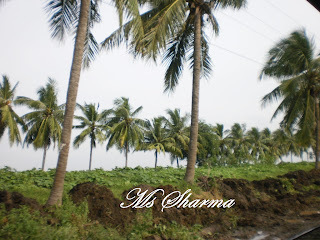 The sandy and salty soils and hot and humid atmosphere near sea is good for cultivation of coconuts. 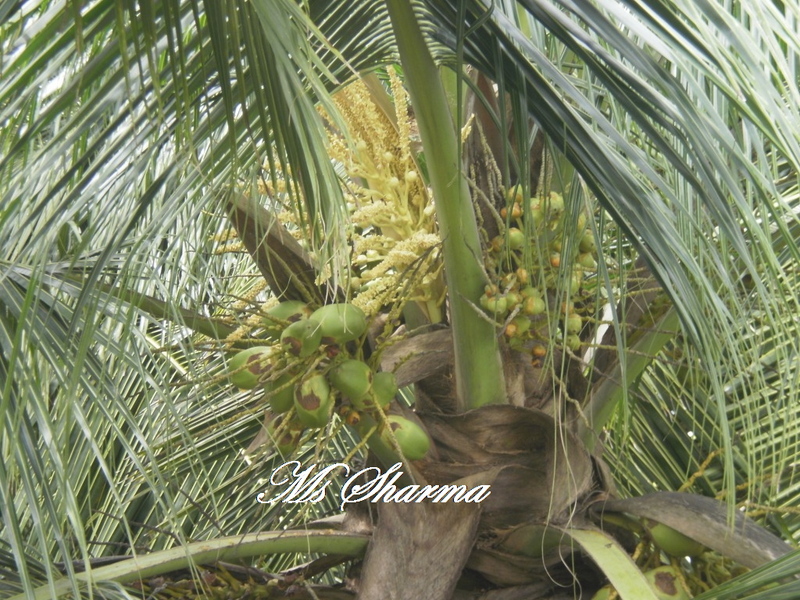 The matured coconut is buried in the soil for sprouting and this is the seedling from which the palm grows. The shoot comes from one of the eyes of the nut. 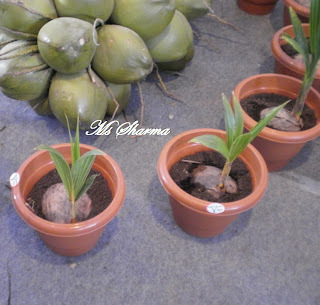 Coconut is known as Naarikella (Sanskrit), Naariyal (Hindi) and Kobbari Kaaya (Telugu). Actually a coconut is a drupe- the seed or kernel is surrounded by the hard shell which is surrounded by the fibrous cover or the husk. Tender coconuts are green in colour, contain more water and almost no meat. 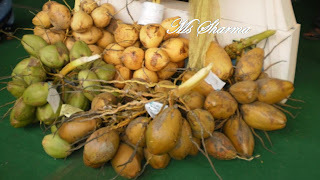 This water of tender coconuts is very good for health and more so in hot summers. As the coconut matures, the water content decreases and the meat increases. Meat of tender coconut is very soft, jelly like, sweet, nutritious and healthy. During summers, people drink coconut water and snack or tender meat to stay cool and healthy. As the coconut matures, its meat becomes hard and quantity of the water decreases when compared to tender ones. Once the husk becomes hard, it is harvested and used as fresh coconut. When left on the trees, the coconut ripens, its husk turns brown in colour and the husk becomes soft and dry. At this stage it falls from the tree. But by now the quantity of water is very less and bitter in taste and the meat is hard and oily. These ripened fruits with the brown husk are left alone for months together till the water inside disappears and the meat dries out naturally. These are used for producing dried coconut and oil extraction. The husk is first removed and is used as the coir used for ropes and many other products. The shell of the coconut is broke open and dried to get dried coconut known as "Copra". Tender coconut-water and meat are used as as drink and snack. Tender coconut water contains, sugar, proteins, salts, vitamins, minerals and antioxidants. It is considered to be equal to saline water used for patients. Meat of slightly matured coconut is consumed as food, used in making of desserts, sweets, curries, chutneys etc. The meat is also grated, grounded and pressed for obtaining the milk. This coconut milk is used in Indian and Thai recipes especially for curries. The dried coconut or copra is also used in various recipes of desserts, spicy powders and curries. Coconut oil extracted from dried coconut is used as cooking medium in the state of Kerala. The oil is used in cosmetics like soaps, skin tonics and hair tonics. It is considered as a hair tonic and applied to hair by the South Indians as it helps in growing hair and keeps it black. The trunk is used as walkways across aqua ducts or water bodies in rural areas. They are hollowed out and used as boats. Trunks are also used for construction, furniture etc. Green coconut leaves are woven in different designs and used for decoration purposes in marriages, or by the rural folk as hedges or roofing materials. They are also used for making baskets, small bowls for cooking some recipes and also for serving. The veins of dried leaves are used as broom sticks in South India. The shells are used as cups as ladles, serving bowls, storing and also used for various handicrafts including musical instruments, jewelry. Coir is obtained from the husk and is used for making ropes, mats, carpets etc as well as for filling of mattresses. Dried leaves, husk, shells etc are used as fuel. 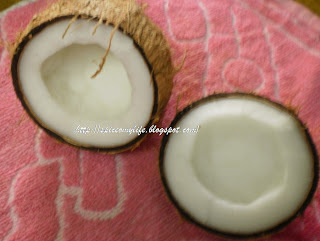 Since we use coconuts very frequently, we are familiar with how to break it. 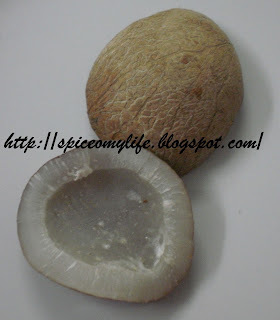 One method is to hold the coconut firmly in left hand and use an iron rod or something hard to break. First the coconut is struck with the rod once, so that it cracks a little. the water is drained out. The nut is hit with the rod again once or twice to break it open completely into two halves. One should be careful in holding the nut so as to not to injure the fingers or the hand. The most common method, which I also use is holding the nut in right hand firmly and hitting it on the floor(made of stone or cement) or a hard rock (granite type). It should be hit lightly first to make a crack, so that the water can be collected with out spilling. Then it should be hit again till it breaks. if you observe the nut it has three eyes on one side. It should be held in such a way that two of the eyes face down. This way the break into two halves is equal and clean.